The real estate industry in Noida has magnified to a great extent with several residential and commercial projects in different parts of the city today. 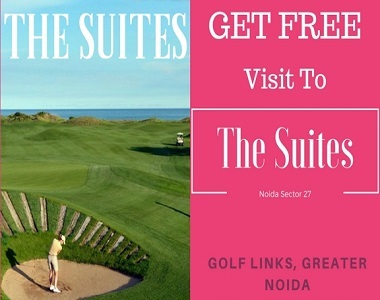 Godrej The Suites is a new residential project in Noida by the real estate giant, Godrej Properties. This residential development is a part of the incredible 100 acre township by Godrej Properties and consists of 3 extravagant towers that offer luxury variants of studio, 2BHK and 2.5BHK apartments. As the apartment areas sizes start at 710 sq. ft. and go up to 1450 sq. ft., A-class space is something that you will find in every apartment. This magnificent development offers premium luxury and a modern-day lifestyle that will simply delight you. The Godrej The Suites Apartments that crafted to perfection, provide good ventilation and contain elevated balconies, Teak wood framed doors, large windows with tinted glass to keep the heat out, vitrified flooring, anti-skid flooring in utility areas and bathrooms, gorgeous kitchens with granite tops, stylish furnishings and fittings, intercom facility and more. The external amenities at this development are world-class and will satisfy you and every member of your family. The external amenities include a swimming pool, 4 mini clubhouses for recreation, a 9-hole golf course and other sports facilities, beautiful play-area for your kids, 24hour water supply, power back-up, landscape garden, open space to always make you feel free, good car parking facility and supreme security to always keep you safe. Situated at Greater Noida in Noida, this development offers easy connectivity to other areas in Noida and also has a number of your daily and emergency places in its vicinity. Places like schools, medical centers, hospitals, banks, ATMs, supermarkets, convenience stores, shopping centers, showrooms, cinemas, restaurants, cafes, malls, public transport and a lot more can be accessed without any hassles. Experience a new world of convenience like never before. Starting at a beautiful price of Rs.38 lakhs and moving up to Rs.70 lakhs, this is worth each and every element of luxury that it has to offer. Godrej Properties makes sure that this development offers only the best and nothing short of it. You can choose from a number of payment plans according to your convenience along with easy home loans at low-interest rates for a purchase with a smile.